Dr Christensen is a professor at the University of British Columbia specialising in ecosystem modelling—in particular data-driven ecosystem model construction. He is known for his work as a leader and developer of the Ecopath project, an open source ecosystem modelling software system widely used for ecosystem based management and increasingly for environmental impact assessment . 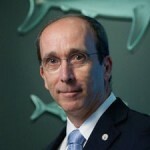 His recent publications have described global ocean models, studied global fish biomass trends, and outlined new habitat capacity models. See the Global Ocean Modelling website for an overview of projects, student activities, opportunities, and other. Dr Christensen grew up in a fishing town, Skagen in Denmark, and everyone in his extended family lived off the sea. Back then, there were 500 boats in his homeport with a crew of around 2,000. Add families and those who worked at the harbour, and you get to around 8,000 – out of a population shy of 10,000. Fisheries were important. Now there are less than 30 boats in the harbour and tourism is the big employer. He was the first in his extended family to go to high school, liked studying, and, not too surprisingly, chose to work with fisheries. After graduation, he worked with the Danish Institute for Fisheries and Marine Research for a decade, for then to be posted by Danida to the International Centre for Living Resource Management (now WorldFish Centre) in the Philippines. He next joined UBC where he has been a faculty since 2004. Villy has worked with the development of the Ecopath modelling framework and software since joining ICLARM in 1990, and it is still one of his major initiatives.